My son loves to dress up in his costumes. He has a bunch of them. One of his favorites is Buzz Lightyear. A few weeks ago he asked me to make him a Woody costume and today I finally finished it.He had a yellow plaid shirt and jeans in his closet. So I got some cow print fabric and went to work on his vest. I used a pattern I had and tweaked it to make it look like woodys. Here's how it turned out. So he got dressed and we were off to the store to find him an old time sheriff gun. 3 stores later we found the gun! I couldn't believe I had so much trouble finding a cap gun. Now he needed something to hold his gun. 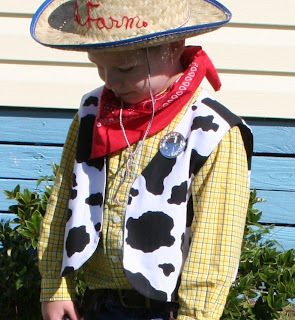 Well Woody had a holster so y'all know what I did at nap time. Wanna make one for your little cowboy? Lay the fringe piece on the curve of the longer side as shown in picture. Fold the shorter side over so the curves match up. Cut the fringe in small strips from the edge up to just below the seam you just sewed. 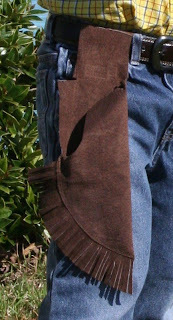 On the back side of the holster sew velcro as shown. All done!!!! Now go velcro it on to your cowboys belt. Oh my gosh! my daughter's 8th birthday is in 2 weeks, and we were just discussing how to make holsters for her cowgirl themed-party! This is perfect! THANK YOU!!! My husband is a big time gun man/cowboy wanna be. If I ever get a son, this will be on the must do list! oh my word! this is the greatest!!! I so wish there was a dress up event so I could go as Annie Oaklee with a set of these! perhaps I'll have to host my own! haha! This is great! I know a litle boy who would LOVE this - I'm going to have to get my act together and make it for his birthday. Thanks for the inspiration. What a super cute little one you have and I love the gun belt..
You continue to amaze me with your sewing skills! Your son is a lucky boy to have such a talented mom!